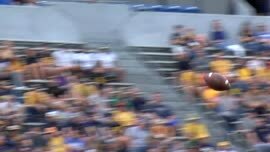 West Virginia quarterback Trey Lowe takes passing reps in a practice last fall. The redshirt freshman also is giving baseball a try this spring, where he could see time as an outfielder for the Mountaineers. 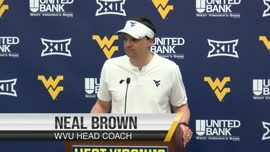 MORGANTOWN, W.Va. — West Virginia baseball coach Randy Mazey said he and football coach Neal Brown are intent on helping redshirt freshman Trey Lowe develop a plan for playing both sports this spring. Lowe is one of three scholarship quarterbacks who will be cramming to learn Brown’s offensive system. The 6-foot-2 native of Collierville, Tenn., also has the potential to help in Mazey’s outfield. Lowe batted .471 with five home runs in his final high school baseball season before enrolling at West Virginia in January 2018. 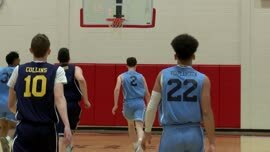 “In the short time I’ve known Coach Brown so far, he’s such a nice guy that he’s worried about how I feel about it, and I’m worried about he feels about it, and poor Trey’s left in the middle,” Mazey said. After enrolling early last year, Lowe practiced with the baseball team but did not see game action. With the more lenient redshirt rule in football, Lowe’s only quarterback action came in the loss to Syracuse at the Camping World Bowl. He had one carry for nine yards and completed both passing attempts. 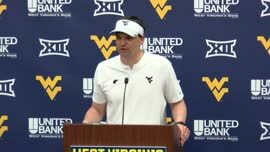 After Will Grier’s graduation, Lowe will compete for the quarterback job beside bowl game starter Jack Allison and Oklahoma graduate transfer Austin Kendall. Mazey understands how critical Lowe’s spring football reps will be. Mazey said no decision has been made between the coaches on how Lowe should split time, but Lowe projects to get at-bats early this season to see how he fares against Division I pitching. “Trey is a great kid and he will do whatever’s asked of him,” Mazey said. While Kendall enters as the preseason favorite to win the quarterback nod, Brown insists no promises were made when the four-star prospect transferred from Oklahoma. He wants all three quarterbacks to compete during spring camp evaluations. Lowe isn’t the first WVU football player to play baseball under Mazey. Garrett Hope played fullback for the Mountaineers from 2012-14 before becoming a full-time catcher for the baseball team in 2015. Drafted by the Dodgers, he has spent the last four seasons in the minors. The baseball team opens its season Friday at Kennesaw State and will spend nine days in the Peach State with follow-up games against Georgia State, Georgia Tech and Georgia Southern. 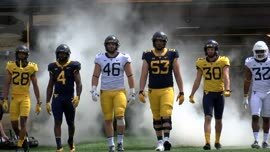 West Virginia’s spring football practice stretches from March 19 to the Gold-Blue game on April 13. Sean Manning has covered WVU and high school sports for three years at The Dominion Post in Morgantown.